This research action is coordinated by AMPHOS21 Consulting S.L. (AMPHOS21) located in Barcelona, Spain, in collaboration with Stanford University’s Center for International Security and Cooperation (CISAC). It is motivated by the general question of how to manage in the long term the growing stocks of spent nuclear fuel (SNF) and high-level radioactive waste (HLW) produced at commercial power plants in a context of uncertain transitions and persisting societal concerns over nuclear energy technologies. A new approach will be developed that merges three academically separated but intellectually related and complementary research strands in the holistic study of nuclear energy systems: Integrated Assessment, Nuclear Waste Management, and Science for Governance. Our aims are i) to combine the research perspectives of the Partners to define a theory for the holistic study of nuclear waste management (NWM) systems aimed at building public trust; ii) to develop an analytical framework as a methodological body for the participatory quantitative story telling of NWM strategies and policies and test it as part of CISAC’s “Reset of U.S. Nuclear Waste Management Policy” initiative; and iii) to complete an integrated analysis of NWM policies in the United States (US) and selected European Union (EU) countries, and subsequently develop a strategy at EU level. HoNESt (History of Nuclear Energy and Society) involves an interdisciplinary team with many experienced researchers and 24 high profile research institutions. HoNESt’s goal is to conduct a three-year interdisciplinary analysis of the experience of nuclear developments and its relationship to contemporary society with the aim of improving the understanding of the dynamics over the last 60 years. HoNESt’s results will assist the current debate on future energy sources and the transition to affordable, secure, and clean energy production. Civil society’s interaction with nuclear developments changes over time, and it is locally, nationally and transnationally specific. HoNESt will embrace the complexity of political, technological and economic challenges; safety; risk perception and communication, public engagement, media framing, social movements, etc. Research on these interactions has thus far been mostly fragmented. HoNESt will develop a pioneering integrated interdisciplinary approach, which is conceptually informed by Large Technological Systems (LTS) and Integrated Socio-technical System (IST), based on a close and innovative collaboration of historians and social scientists in this field. HoNESt will first collect extensive historical data from over 20 countries. These data will be jointly analyzed by historians and social scientists, through the lens of an innovative integrated approach, in order to improve our understanding of the mechanisms underlying decision making and associated citizen engagement with nuclear power. Through an innovative application of backcasting techniques, HoNESt will bring novel content to the debate on nuclear sustainable engagement futures. Looking backwards to the present, HoNESt will strategize and plan how these suitable engagement futures could be achieved. HoNESt will engage key stakeholders from industry, policy makers and civil society in a structured dialogue to insert the results into the public debate on nuclear energy. I have been involved as one independent expert for the review of the country reports in the first phase of this project. ACP-EU Co-operation Programme in Higher Education EDULINK II. EuropeAid, European Commission. PARTICIPIA is a three-year project funded under the EDULINK II programme; an ACP-EU Co-operation Programme in Higher Education funded by the European Development Fund (EDF) and the Development Co-operation Instrument – Relations with South Africa (DCI). This project, co-ordinated by the Universitat Autònoma de Barcelona (Spain), aims at developing and implementing innovative and competitive Master modules and/or programs in Participatory Integrated Assessment of Renewable Energy Systems in the ACP-member states of Botswana, Namibia and South Africa. In this way, and through the dissemination of related know-how through non-academic channels, the action seeks to foster access to alternative energy technologies and their efficient utilization in different socio-economic and geographical contexts in Southern Africa. As Post-doctoral Researcher and Project Manager of PARTICIPIA I have been involved in all academic activities. Several papers will be derived from the case studies applying the multi-scale integrated assessment to the energy issues in those Southern Africa countries which I will be co-author. FP7-PEOPLE-2013 Marie Curie IRSES. European Commission. The general aim of NETEP—European-Brazilian Network on Energy Planning is to create the basis for interdisciplinary research and knowledge transfer on energy planning. The proposed exchange programme envisages a significant contribution to the development of sustainable energy planning strategies that will support future decision making. NETEP brings together partners having different types of expertise in the field of energy analysis and operating in four different countries: Portugal, UK, Spain and Brazil expressing different energetic metabolic patterns and different energy market structures. Staff exchange will enable partners to share knowledge on models and methodologies and on the possibility of implementing or adapting them to different energy systems. The knowledge generated will benefit energy decision makers and the scientific community. The outputs will result in a relevant contribution to the general target of achieving sustainable energy societies in the future. Visits between universities’ research staff are expected to create the basis for proposing joint projects and long term collaboration. The participation and training of early career researchers is a key aspect of the proposal and joint supervision of their work will be valuable means to ensure proper collaboration and knowledge transfer between EU and Brazil. During our visiting stay in Brazil in May 2014 our team established a first collaboration with the COPPE of the Federal University of Rio de Janeiro (UFRJ). I have been involved as one of the early career researchers of this project. Results from studies will be presented in two international conferences in 2015 and two papers are in preparation which I am co-author. Consultant and Coordinator of the studies on energy and construction. In 2014, our research team was commissioned by the Ecuadorian Secretariat for Planning and Development (SENPLADES) to train their teams in multi-scale integrated assessment. The collaboration was aimed at strengthening human and institutional capacities in designing and evaluating future development scenarios within the context of the National Plan for Good Living. Several training sessions of SENPLADES team members were organized in Barcelona and in Quito. During this collaboration, I was responsible for conducting the studies and coordinating the training of the teams on the energy and mining sectors, as well as on the construction sector of Ecuador. This collaboration led to the creation of the Centro de Prospectiva Estrategica (CEPROEC) hosted at the Instituto de Altos Estudios Nacionales (IAEN) in Quito and led by my former PhD advisor Jesus Ramos Martin. Several papers and an edited book are in preparation both in English and Spanish which I am co-author. Results of this collaboration have been presented in various national workshops, international conferences, including the 8th annual summit of the Union of South American Nations (UNASUR) in December 2014 in Guayaquil, Ecuador. 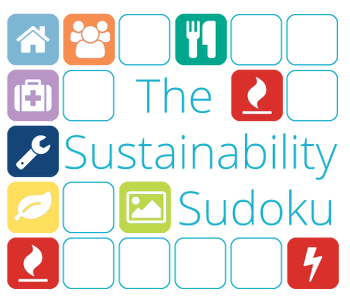 The Sustainability Sudoku is a didactic and interactive tool to promote an informed discussion over the sustainability issues. The Sustainability Sudoku is a game, but at the same time it conveys an important message: Wake up! It is time for a fresh view on what is happening on this planet! In 2012, our research team was commissioned by the Energy Team of the Climate, Energy and Tenure Division (NRC) of the UN Food and Agriculture Organisation (FAO) and sponsored by the German Federal Enterprise for International Cooperation (GIZ) to conduct an application of our integrated analysis approach, the Multi-Scale Integrated Analysis of Societal and Ecosystem Metabolism (MuSIASEM), to the nexus between energy, food, land use and water. In this project, I have been responsible for the coordinating the energy analysis of all case studies and the integrated analysis of one case study. Specifically, this case study consisted in an assessment of two alternative energy sources to produce electricity in the Republic of South Africa. The results were presented at the Global Land Project Open Science Meeting (GLPOSM) conference in Berlin in March 2014. This GIZ-funded FAO project led to the publication of one report in the Working Paper series of FAO and an edited book published in 2014 at Routledge. I was co-author of the working paper, first author of one book chapter and co-author of three other book chapters. AREVA Federal Services LLC (AFS), Boston, MA, USA. Project: Hanford Vitrification Plant (Hanford Site, WA), the world’s largest radioactive waste treatment plant, used for vitrifying Hanford’s tank waste for the U.S. Department of Energy (DOE). As a Mechanical Engineer, I designed recirculation pumps through Finite Element Analysis (FEA), and performed the verification and validation of an integrated software for the piping design stress analysis of the recirculation loop. AREVA Inc. North America, Boston, MA, USA. Project: Civil/structural engineering support to the Probabilistic Risk Assessment unit for the Design Certification Licensing of the US EPR™, a generation III+ nuclear reactor, by the Nuclear Regulatory Commission (NRC). As a Structural Engineer, I performed and coordinated dynamic structural analyses of the U.S. EPR™ reactor under accidental scenarios. Project: Structural design of nuclear reactor buildings and management of execution calculations (150 pers., 5000 plans, €11 million) of the EPR™ in France (Flamanville3) for Electricité de France (EDF). As a Structural Engineer, I computed and tested soil-structure interaction models of one of the EPR™ nuclear reactor buildings, calculated reinforced concrete structures and studied anchor plates for the nuclear reactor pool liners, and managed draftsmen for producing plans after the calculations of the reinforced concrete structures. I also took part as Project Director Assistant in the supervision team (5 pers.) for coordinating production offices in France (45 pers. ), Tunisia (50 pers. ), Morocco (30 pers.) and Egypt (20 pers.). Last updated on July 2017.